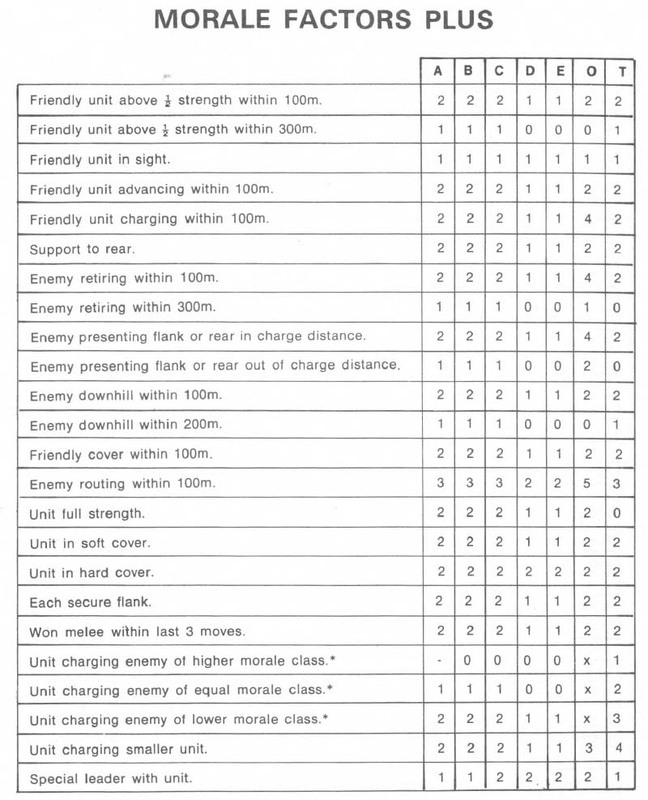 Many wargaming procedures involve dice to resolve combat or test morale, and many of these dice rolls come with a list of modifiers. Typically, a die roll modifier adds or subtracts some factors to the roll, and affects the target number to beat a certain result - whether a number in a table or an opposing die roll. When you look at older rule sets, one often encounters huge lists of modifiers. I often wonder whether such rulesets were playable at all. Below is an example from a seventies-era ruleset. Modifiers are determined not only based on a certain condition, but also on troop type. Unworkable, if you ask me! Die roll modifiers from a 70s era ruleset. 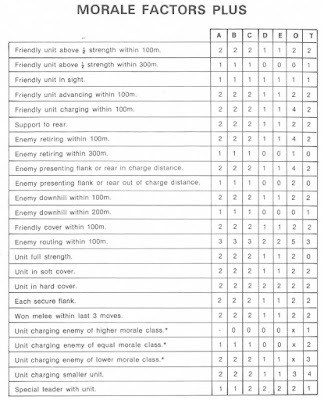 Cross reference the troop type (A, B, ...) with the situation to get a modifier to apply to the die roll. These are only the positive modifiers. The ruleset had a similar table for negative modifiers! Are modifiers situational or inherent? What is the purpose of the die roll modifier? How many modifiers per roll? How significant should the modifier be? A first type of die roll modifier models a variable (possibly based on historical record) reference for the specific action. E.g. one might have a specific procedure for determining the casualties due to firing, but some troops are of better quality, hence, they get a positive modifier when they fire at the enemy. I would call such modifiers inherent modifiers. They depend on troop characteristics, and are used to introduce variability between troop types. A second type of modifier represents situational circumstances. E.g. a unit in cover might get a positive modifier when being shot at, or troops uphill get a bonus in melee, or charging gives an advantage to the attacker. Such modifiers depend on the tactical situation in which the troops are placed. They typically do not depend on troop type, but on the situation in which the troops find themselves. I call them situational modifiers. Sometimes you have a mix between both types. E.g. in a Napoleonic game, a modifier might state that lancers have an advantage on combat, only against infantry in line or square, but not against other troop types. Such a modifier is inherent (lancers), but also situational (target must be infantry in a specific formation). So the distinction is sometimes hard to make. Mechanically, the purpose is clear: to increase or decrease the probability of a die roll succeeding, and affecting the outcome that is linked to the die roll. But a more important factor to consider is whether the modifier affects the decisions made by the player, or simply adds some variation to the die roll procedure (sometimes called chrome). The latter can be fun, but often slows the game down, and might give a false feeling of realism (after all, a huge list of modifiers implies the rules designer knows his history, right?). The former is - at least in my view - a much more important effect of die modifiers: do they steer the decisions made by the player? I do think that the true purpose of modifiers should be to influence decision-making during the game. Hence, situational modifiers are preferred, and inherent modifiers to be avoided. After all, you can decide whether to put troops in cover or on a hill, but you cannot decide that your cavalry suddenly becomes equipped with lances, or is better in morale. At most you can decide where to deploy certain troop types before the game starts, but that's a pre-game decision that is different from a tactical decision in-game. That does not mean one cannot make a distinction dependent on troop type, but it should preferably be reflected in the troop characteristics, rather than in the modifiers when resolving a die roll. If we want modifiers to guide decision-making, I think they should be limited in number such that a player can learn them by heart, rather than having to look them up in the rules all the time. Too many modifiers will simply result in a lot of random number-adding, ending with an overall +0, +1 or -1 anyway. 3 or 4 modifiers per procedure seems to be a good number. It allows players to remember them, and make each modifier significant enough such that they do not get drowned out by other effects. I know it can be fun to distinguish between all sorts of cover, but does it really matter (unless the game considers it at the heart of its gaming engine)? Simply use one type of cover with a single modifier, and that's it. Limiting the number of modifiers to a significant set that influences actual decision making is part of designing the rules. Playtesting also might give you insight what modifiers players will use actively in their choices during the game, and what modifiers are just chrome, and subsequently, can be tossed. Also, modifiers that describe situations that are so exceptional that they happen only once during an entire game, should be avoided as well. Modifiers should also be significant. A +1 modifier on a D100 is not going to actively influence decision-making. Some time ago, we had a discussion in my gaming group when playing a recent set of rules that used a 2D6 die roll to activate units. Most units needed a 5+, 6+ or 7+ to be activated, with 6+ being the most common number. However, none of the players felt that having 5+ or 7+ troops guided their decisions. Rather, it was the tactical situation on the field that drove the decision what unit to activate next. Thus, the activation rolls can as well be set at 6+ for all troops (it saves time! ); or should be spread out to 4+, 6+ and 8+ if we want to give them a meaningful role in the game, such that the differences in probabilities become significant enough for the player to cosnider them. Modifiers should mean something, not simply add some random noise! Overall, I think that modifiers are an important aspect of game design, and it does matter what the intent is. If the intent is simply to add chrome, go wild, add lots of modifiers reflecting all sorts of different things! But if the intent is to guide decision-making, better limit yourself to situational modifiers, keep them limited in number, and large enough in effect. There's some follouw-up discussion on this thread on The Wargames Website. Phil, your conclusion is well stated. Too many modifiers and/or too large of a random component (via the die range) and the tail CAN wag the dog. For me, that tends to push the player out of the decision making cycle and makes the game either a crap shoot, an exercise in accounting, or both! Historically speaking I'm not sure modifiers make that much difference to tactical decisions. - It will depend upon how much of games player you consider yourself to be. If for example you play a Napoleonic game do you use period tactics or merely those that may be advantageous in the terms of that game - which of course may not be very Napoleonic in the same way that Lion Rampant is decidedly un medieval. Many games players get hung up on minor tactics- often the wrong minor tactics and such esoteric as "activation rolls" rather than how to formulate a plan as a historical counterpart would do . The problem with many "games mechanisms" in today's "games" is simply that they have exchanged dice rolling for the player making a decision. Surely the dice rolll should come After the decision not before. I do agree, but the game mechanics should be fluent that they are playable. It is a game after all. I see game mechanics as a tool to reward proper historical tactics, and punish bad ones. But it's up to the player to decide what he does, of course. The Field of Battle series doesn't use modifiers, but instead modifies the dice type. So a d10 roll will be modified 'up' to a d12, or 'down' to a d8. There is always an opposed roll situation, so the defender will be rolling a dice against this in order to defeat. In terms of 'hits', one has to beat the defender by three pips. It's always seemed quite elegant, though perhaps it introduces too much variability vs the modifier style system - where increasing amounts of modifier dilute the effect of the random die roll somewhat?